Subtle signals a dog puts out warning us that he will bite us and where on our bodies he will bite. 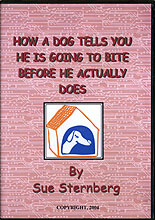 Sue handles iffy shelter dogs, and the audience narrates what they see. Sue Sternberg is the founder and director of Rondout Valley Animals for Adoption, a local not-for-profit open admission animal shelter in upstate New York. She is also the founder of the Community Animal Shelter Association (CASA), a not-for-profit organization dedicated to pet owner outreach, safe animal adoptions, and quality of life at animal shelters around the world. Sue is an expert in dog aggression and an innovator in the field of shelter dog welfare, and she develops programs to prevent pet relinquishment and overpopulation, to match families with safe pets, and to help shelters attend to the mental health of the animals in their care. Training Wheels®, a mobile community outreach program, and Assess-a-Pet™, a method to evaluate animal temperament, are two popular programs developed by Sue. With over 23 years of experience she shares her knowledge of dog behavior on radio and television shows, as a popular speaker at national humane and dog training conferences, and through books and videos.